Our robotic arms can operate in almost any industrial sector. Find out more about our solutions for your industry. From SCARA, FAST picker, 6-axis and collaborative robots to controllers and software solutions, Stäubli has a full line of products. Do you have industrial robotics questions or training needs? Discover with Man & Machine from Stäubli Robotics all the industrial robotics news troughout the world. Meet Stäubli robotics experts worldwide. Strausak delivers more than 500 grinders a year to customers worldwide. 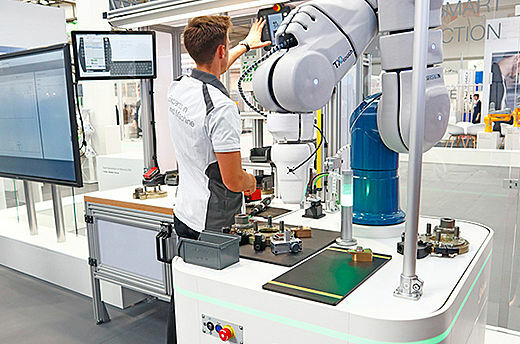 The Stäubli TX60L 6-axis robot is compact, easy to use, and performs operations with precision and flexibility. Chinese company Fu Ling Zha Cai, which specializes in the production of mustard pickles, has crated a pioneering production line using FAST Picker TP80 robots. This high-quality system produces excellent results. Renowned manufacturer Rosenthal relies on Stäubli robots for its porcelain production.